My secret hobby. 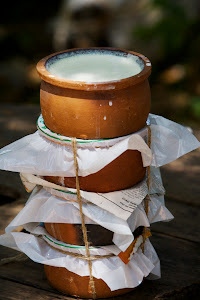 Making yoghurt at home, inspired by the thick buffalo curd they make in Sri Lanka. Are you qualified to tell me about yoghurt? The current batch of yoghurt represents my 18th so far. I’ll be honest, the first 12 were not fantastic, there were some that I couldn’t eat. They were so foul that I thought about giving up on making yoghurt all together. My wife and I have a ritual, where I dish the yoghurt after the meal and we sit and enjoy it together. During those dark times, I lost all energy to serve yoghurt and she ate the store bought variety. There was light at the end of the tunnel. The last 6 batches have been amazing without fail. And the reason they were so consistently good is because of a handful of simple steps that I’ve learned. These later batches are thicker and tangier than anything I have bought in a shop. They are the perfect yoghurt. Heat the milk Heat 3 and a half cups ~ 0.875 quarts of milk and a quarter cup of cream in a small saucepan to 85 degrees celcius ~ 185 F. Once the temp hits around 60 celcius ~ 140 F, start gently stirring the milk with a spoon. You don’t want to burn the bottom of the milk. why heat the milk? Firstly, it’s a good step to kill any bacteria that are growing in it (highly unlikely if bought from a shop) but the most important point is that it denatures the proteins in the milk. It breaks them down so that our live yoghurt cultures can snack on them and make better yoghurt. how long does it take? I’ve found that on a low-medium heat the milk will rise by 10 celcius in 5 minutes. At 60 celcius you’ve got 12 or so minutes to go. Let the milk cool slowly to 45 degrees celcius Once the milk reaches 85 celcius, turn off the heat. Let it sit in the saucepan and cool naturally by the air. Give your milk a stir every 10-15 minutes to let off some steam. You’ll see a thick layer form at the top of your milk. This is normal, it’s the fat in the cream. Just stir it gently back in. how long does it take? It will take about 1-2 hours to cool down to 45 degrees celcius ~ 113 F. So feel free to watch the evening’s TV and stir the milk during the ad breaks. Gently stir in the old yoghurt Your old yoghurt should be at room temperature. Stir 3 soup spoons into your milk. This is important, do not stir vigorously you’ll curdle the milk! It’s completely OK if your old yoghurt settles in lumps at the bottom. Relax and be gentle. Pour milk into a container and keep warm Yoghurt cultures love to breed in warm temperatures - not hot, warm. 38 celcius ~ 100 F close to body temp will produce a slower growth but a much smoother and creamier yoghurt. I suggest sticking as close to 38 celcius ~ 100 F as you can. The yoghurt that results is smooth and creamy, it’s the result of a slow yoghurt growing process. Keep warm for 12 hours I like my yoghurt thick and tangy. Yoghurt thickens by about 6 hours, after that each additional hour will give you more tang. So if you like your yoghurt bland, stop after 6 or so hours, but the rest of us keep waiting until you hit the magical 12 (overnight is good). Refrigerate for 6 hours Stick your yoghurt in the fridge once you’ve finished growing it. The cool temperature in the fridge stops the yoghurt growth and allows it to set even firmer. At this point, your yoghurt is read to eat. But I have one more step to make the perfect thick yoghurt. Strain your yoghurt for 2 hours I have a cotton singlet which I purchased in a 4 pack from the supermarket stretched over a colander. Then I tip all of the yoghurt into the colander, with a bowl underneath to collect the whey. You can keep it out on a bench or in the fridge, it’s up to you. After 1 to 2 hours you’ll see a pool of greenish watery liquid in the bowl under your colander. Your singlet will be completely soaking wet. That liquid is whey. It’s naturally separated out of the yoghurt curd, leaving behind a really thick set yoghurt. This step is an absolute must if you want really thick yoghurt. Your strained whey is useful too. You can use it in bread (I’ve never done that), drink it in a protein drink (I’ve never done that either). Or put it on your tomato plants (I have done that). The tomatoes love the calcium. Recipes are great to have, I followed some I found while I was developing this yoghurt recipe. But if you want your yoghurt perfect every time with a great consistency and flavour then you’ll need these secrets. They are the difference between those first 12 inconsistent attempts and the last 6 amazing ones. Thermometer Buy a food thermometer. There isn’t much point making yoghurt unless you have one. I got mine at about batch 12 and found that I was killing my yoghurt by incubating at 50 celcius. You’ll be bitten by similar problems unless you get a thermometer. Rice Cooker My secret to keeping the yoghurt warm is a rice cooker which I leave on “keep warm” mode. With it’s lid off it keeps my yoghurt at the perfect 38 celcius. I fill the rice cooker with enough water to cover the yoghurt container when it is sitting inside. Cream Buffalo milk like they use in Sri Lanka doesn’t need to be strained. It’s thick already. It has a much higher fat content than cows milk, which is why the yoghurt gets so thick. I use the cream to boost the fat content a little. Don’t add much. Stick to the guidelines I listed above. Otherwise your yoghurt will taste like the sour cream you buy in the shop. Starter Yogurt I use my last batch to start the next one, but I’ve tried several store bought varieties. I found that starting with a runnier yoghurt like one formed by goats milk lead to similar yoghurt growing. So now I start with a thick unflavoured natural greek yoghurt. What makes your yoghurt amazing? Is your yoghurt a total success or a flop? Let me know in the comments!